I have been seeing so many DIY ceramic mug projects over the last month and they seemed like the perfect weekday night Pretty Little Pastime! I moved across the country a few years ago and still have so many friends on the West Coast that I thought the Long Distance Friendship mug would make a sweet gift. Instructions: Print out or reference the state shape or outline you want to showcase on your mugs (one for you and one for your gift). Preheat your oven to 350 degrees. While it is heating up, begin drawing your image on the first mug. 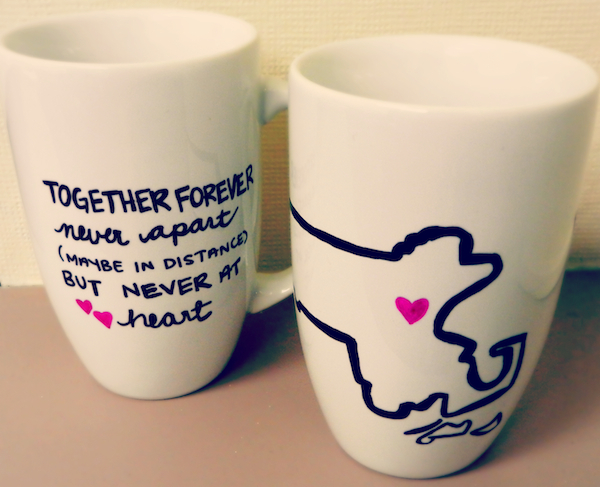 Alternate state drawing and text on different mugs so each has a chance to dry. Go over each section twice, or as many times as you would like to get the desired thickness. Once finished, place the mugs on a baking sheet standing up and bake them on the middle rack for 30 minutes. Carefully remove the mugs and let cool before handling. This Pretty Little Pastime can be tweaked for any occasion or to personalize plain dinning wear. Can’t wait to try it on ceramic plates next!